WELCOME to my web site! I was diagnosed with Carcinoid Cancer May 10, 1995. Go to my Carcinoid section (and other sections, see to your left) to learn more about Carcinoid Cancer and for links to additional medical and useful information sites for people (and their families) with Carcinoid. Be sure to check The Carcinoid Cancer Foundation, Inc. (CCF). 27 April 2017 this web site was 20 years old, the 1st by a Carcinoid patient! There will be a “Celebration of Life” event from 1 PM to 6 PM on 17 December at Beach House, 603 East Carla Vista Drive, Chandler, AZ 85225. 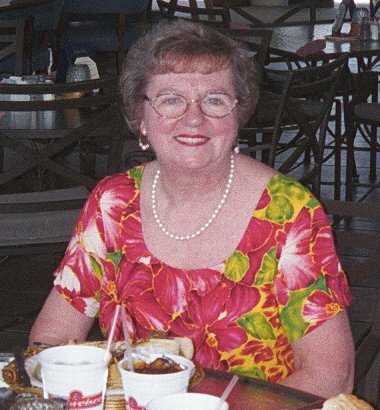 There will also be a “Celebration of Life” event at 10 AM on 22 December at Bella Vista, 1825 W. Emelita Ave, Mesa, AZ 85202. There is HOPE for those diagnosed with Carcinoid/NETS. I've started my 23rd year of active, full life: May 10, 1995 -- May 10, 2017.
the FIRST by a Carcinoid patient. I was diagnosed with Infiltrative Ductal Carcinoma (IDC) Breast Cancer on June 18, 1999. I was diagnosed with Type 2 Diabetes December 6, 2004. Another challenge March 2013 I was diagnosed with Stage 4 Chronic Kidney Disease. April 23, 2014 I began Dialysis every evening at home due to being Stage 5. In May 2014 we left our beloved home of 32 years and moved to an independent living community in Mesa, AZ. The down-sizing was very painful! to view the 90 second book trailer video from YouTube! My story is one many of you can identify with – an uplifting look at a life that I am determined to live well, despite all the obstacles I have been dealt. At the heart of the story is the idea of LIVING with cancer. It took eight years to correctly diagnose my rare disease, Carcinoid/ Neuroendocrine Tumors. Then, they said I would die in just a few more years. That was 18 years ago, and here I am! How have I faired? Very well. 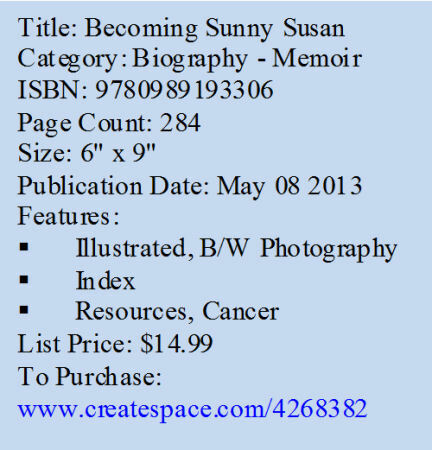 Read the book to find out how I have lived a happy life, even with cancer. Would you help to spread the positive word by telling your friends, by gifting the book, and by posting a review for other readers on the www.amazon.com page? We know how valuable a positive recommendation can be. PLEASE take time to read "My Complete Carcinoid Story" or if rushed read the short version "My Short Carcinoid Story", and review the information through this web site and linked from here -- the result of over twenty (20) years of my research and work (since http://www.carcinoidinfo.info/mystoryshort.htm May 1995). Check the "Monitoring Carcinoid" section to read about tests and test frequencies recommended by several experienced Carcinoid physicians, and the "Local Support Groups" to learn if there is a group in your area. Be sure to check the COPING and FUN section. 2013 - Another challenge -- March received the diagnosis of Chronic Kidney Disease - Stage 4. Since then have gone on "vacation" from Peg Intron-A for awhile while remaining on Sandostatin LAR every 28 days. I have had blood transfusions (gave me back my energy) and we are working, among other things, to prefect the correct diet mix of diabetic and kidney disease - stage 4. On November 10, th the Carcinoid Cancer Foundation released the second video, "Faces of Hope," in its 2012 series. Meet NET cancer survivors Claire, Josh, Judy, Kathy, Kenneth, and "Sunny" Susan (and Howard as a “care giver”) as they share their journeys about being diagnosed and living with rare neuroendocrine tumors, including lung carcinoid, carcinoid of the ileum, and pancreatic neuroendocrine tumors". http://www.youtube.com/watch?v=5IqspD6YDEo If you don't suspect it, you can't detect it." 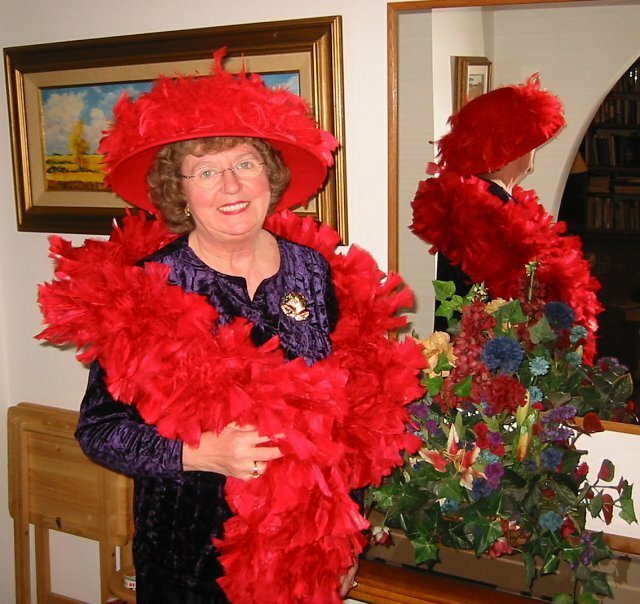 My husband, Howard, and I reside in beautiful Mesa, Arizona, USA, where the sun shines more than 300 days each year, the flowers are always in bloom, the birds are always singing, we usually have bright clear blue skies, and it is a great place to live, count our blessings, and enjoy life! April 27, 2017 was the 20th anniversary of this page; the FIRST by a Carcinoid patien!. The guest book was added Nov. 16, 1998, but had to be taken down April 20, 2004 due to infiltration by spammers! PLEASE continue to scroll down this page, thank you! I believe many of us may lead a full and active life while LIVING with Cancer, and other chronic conditions. I have provided information and links for medical / drug databases, local support groups, humor, books, Bluegrass music, prayer lists, travel, political issues, AZ information, cowboy poetry, and much more that may assist you in living a full and almost normal life! (Click the buttons on the left side of this page, or use the "Search" button to find a specific item of interest.) I have provided information and links to information I wish had been on the internet when I started my research in May 1995. MY MISSION: Answer the emails from around the world, generated by my web site, and provide solid medical information and/or links to such information. 5) get on with life, give thanks for each and every day and live life to the best of their ability. I consider myself an "advocate for carcinoid cancer and neuroendocrine tumor awareness". I am a survivor of Carcinoid Cancer and Breast Cancer. Click on any picture above to see an enlarged image, thank you. 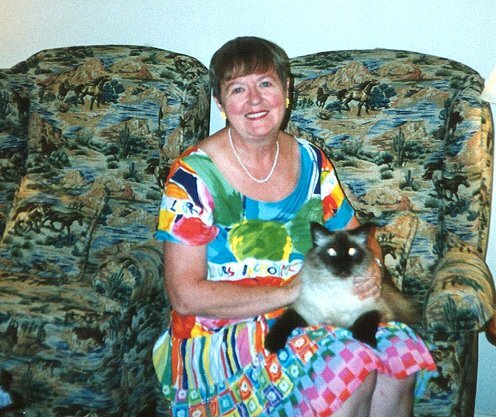 From left to right: Howard and me in San Diego, CA, August 1995, within three months of my Carcinoid Cancer diagnosis and surgery; Kauai, HI, September 1997; Susan and Levi "The Birman" cat, October 1997; at the first Carcinoid Seminar, Sarasota, FL, March 3, 1999; at my computer Oct. 1999; after the Carcinoid Symposium, Sarasota, FL, May 13, 2000; Susan giving presentation at the first Patient Support Advisory Board meeting in New York City, Nov. 2001; Susan member of Red Hat Society, Dec. 2003. -- Many more pictures in our "TRAVEL" section. Since 1996 --- when I first located others with Carcinoid --- I have answered every email sent to me, although some replies were delayed longer than I liked. I am NO longer able to reply to all e-mails due to the volume and other things going on in my life (all good). I do love hearing from others, but an unable to reply to all individually. This web was 20 years old on April 27, 2017. Since my husband "retired" I am away from my computer for days, and sometimes, weeks at a time. Yes, there is wireless internet and we have tried that a number of places. But, if I deal with email when we are away from home then it is not a "restful vacation" for me. PLEASE use the SEARCH capability at the top my pages. You may search for a word, a phrase, a drug, a treatment, a book title or anything you can think of. You may search this site only, or search the complete World Wide Web. 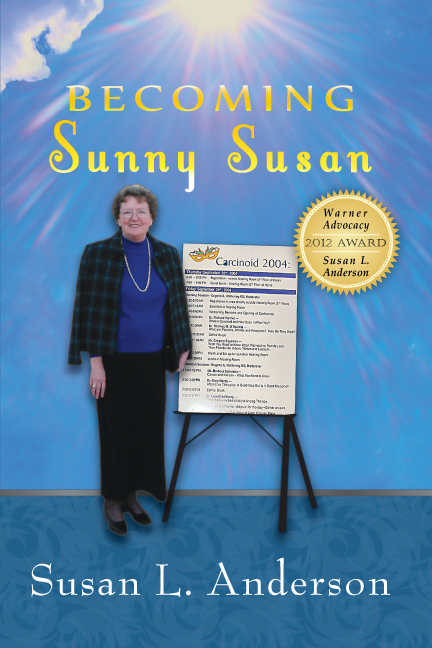 Send mail to SunnySusan@cox.net with questions or comments about this web site. Copyright © 1997-2014 Susan L. Anderson. All Rights Reserved.